Brad Stevenson talks about creating a search experience which spans an On-Premises and Office365 SharePoint 2013 environment. So what is the story about the cloud search capability? Crawl freshness is important for any search system as its important that a user trusts the results they are given. Part of this trust is that they are seeing the latest content within a timely window. Query latency is already really quite snappy in SP2010 online. SP2013 moves to client side rendering approaches to improve this snappiness perception even further. This approach allows the server to share some of the rendering load with the client device improving performance for the end user. Scale in SP2013 originates from the FAST technologies so brings those benefits to bear, making it a powerful and scalable platform solution. Manageability within SP2013 allows more control over the schema, examples are the control over managed properties and result sources. A lot of the features which were part of the service application have now been brought down to the site collection and tenant administration levels. User Experience is dramatically different with new capabilities such as hover panels, visual refinements etc. This helps a user to establish the relevance of a result without leaving the results page or downloading the documents. Extensibility is improved without writing code with such elements such as the rendering templates replacing the complex XSL. You manage your ‘global search’ via the tenant admin interface. The only major piece of the service application settings you have no control over is the crawl scheduling. In a multi-tenant environment this really makes sense. 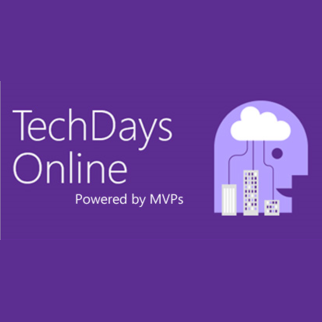 Public cloud – Office 365, allows you to focus on just the software services. Private cloud – Windows Azure, allows you to offload the OS and hardware to the cloud provider. What to move? (not just everything) and should it be everything including customisations and settings. When to move it? How do you plan the move? Is it an all or nothing or staged co-existence. How to move it? What tools are available? User want to easily find content, they just want to find things they’re looking for and not have to think about understanding the systems structure. It is about getting their job done efficiently. Users don’t care about migration. So don’t force users to track what’s being moved and when. Realise that most users will never move EVERYTHING to the cloud. So the idea is that from within either environment the user can get results from either. They use query rules to ‘cross-pollinate’ results from the other environment as a block of results. Personally I’m not sure this is a great user experience. It gives a false impression to a user of which results are most important. So I remain to be convinced about using result blocks. A neat thing to know is that the refinement panel operates over ALL returned results rather than just the local SharePoint items. Also the hover panels are dependant on the sources WOPI configuration. 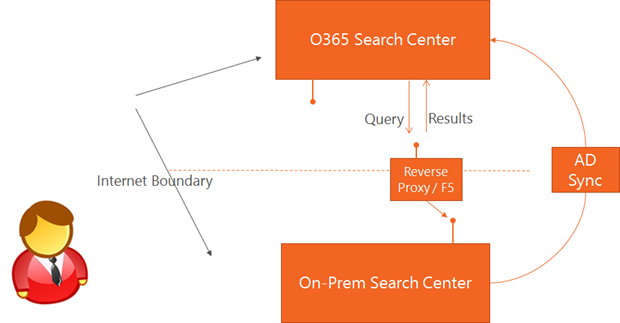 If you are early on in your migration lifecycle a one-way where on-premises indexes Office365 might suit your needs. Or late on a one-way works for Office 365 to use on-premises. Mid-life is definitely bi-directional where the experience should be the same. Where will users go to search? User logs into on-premises and issues a search query. It actually issues two queries. First is to the local on-premises index. The second is issued to Office365. The second query is issued through the CSOM endpoint within Office365. Identity mappings take place where the on-premises identity is mapped to the Office365 identity. Office365 then performs the query and issues the results response. Basic flow is a reverse of on-premises except there is the introduction of the revers proxies at the perimiter to route the request back to the on-premises SharePoint. 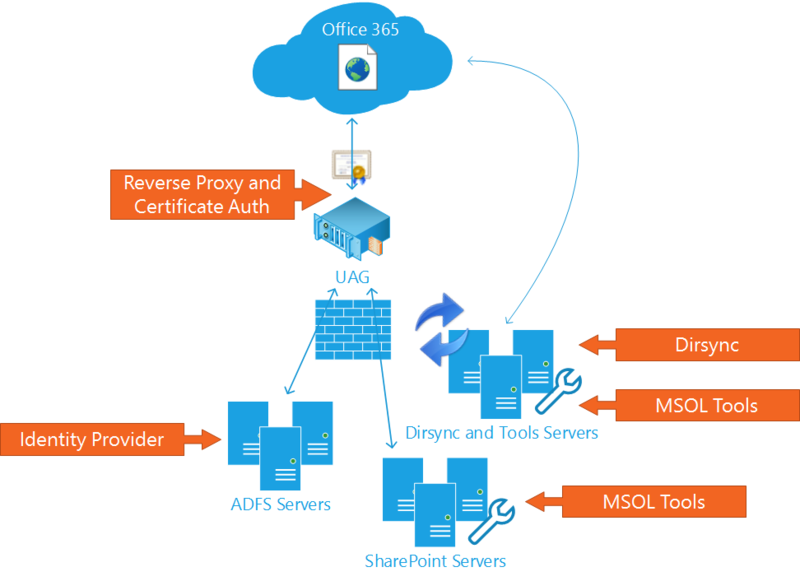 Identity is mapped from the Office365 user to the on-premises user. This means that in both scenarios there is correct data security trimming. Crawl versus Query – Chosen to go the query root as the crawl infrastructure within Office365 was limiting. Also hundreds of thousands of tenants need to have a consistent performance maintained. 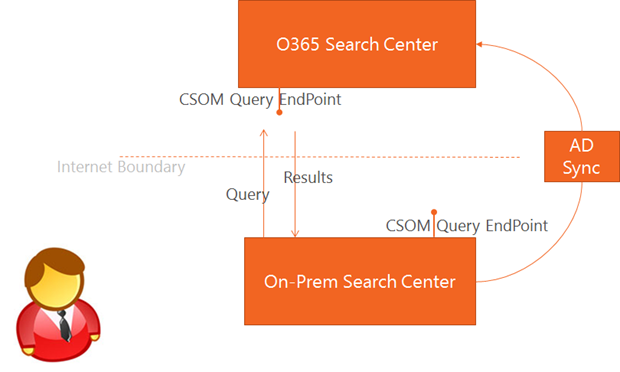 Query helps to provide the best and most consistent user experience. Relevance and clicks – Search learns over time. Search watches which results are clicked for specific queries and adjusts over time. Background compatibility – Should provide other MOSS and SP2010 on-premises hybrid. This was not possible due to some significant infrastructure and services which would have required significant investment in extending the previous SharePoint versions. One major element was the challenge of identity mapping. The demonstration showed the example of a glossary. This is stored in a SharePoint list on-premises. It is very useful information, but is not something users query for all the time. 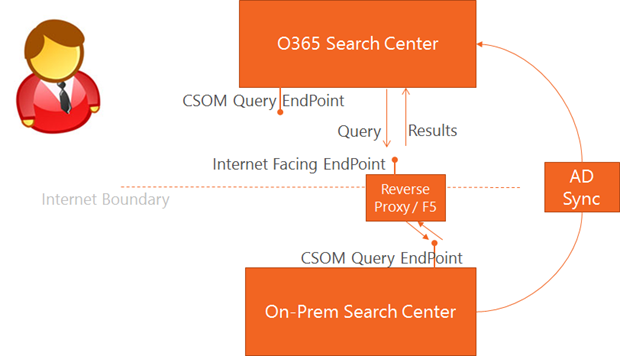 From on-premises the demo pulls ‘people’ results from Office365 via a dedicated search vertical. To get the on-premises ‘people’ page to use the Office365 profiles it is as simple as pointing the web part settings to use the remote result source. This means when the users click the people results it goes to the Office365 profile page. Question is what happens to the links to people in normal item results? Question about multiple people stores. Answer was the suggested best practice is to host in just one location. For users on-premises accessing on-premises links are fine. Once the user is on the Office365 search results the results now have internal only urls. The click through doesn’t route through the reverse proxy anymore. So users must have that external access to the internal system. One solution is to have a VPN or Direct Access or leveraging the reverse proxy for url re-writing. Microsoft recommend using VPN or Direct Access as it is easier to maintain over time. The WOPI previews are operating where-ever the content is being served from.